Inflation can either ruin or build your wealth. Which do you choose? Your money is losing purchasing value and at the same time prices are increasing. This is extremely damaging to a person’s wealth, as someone’s savings can literally become worthless. 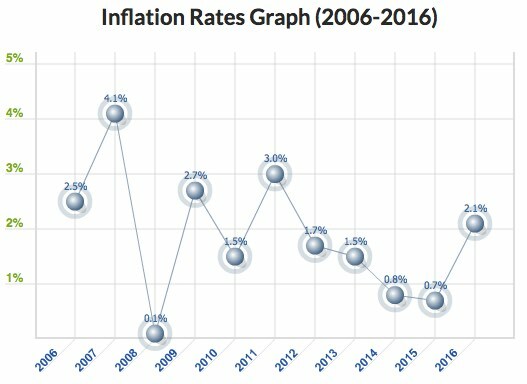 When inflation happens slowly over time, most people don’t notice it. But, little by little, a person’s wealth is disappearing through inflation. However… there is a way to protect against this silent thief. Inflation affects those who hold a fiat currency. And in today’s world, that’s pretty much every currency in existence. Fiat currency is legal tender that has been created by a government. It is backed by the government itself instead of a physical commodity. If the reputation of a government declines, so can the currency that it issues. If a government spends its money recklessly, then it will start to rack up debt. The easy solution for a government that racks up lots of debt is to print more money. Instead of cutting back on its expenditures, it just pays off its debt with the newly created fiat currency supply. This is when a currency is headed for a death spiral. When a government is using its fiat money to pay for non-producing expenses. On the other hand, if a fiat currency is used to invest in capital-efficient projects that produce more wealth, then the currency is put to good use. Further wealth can be created that wouldn’t have normally been achieved if there hadn’t been a fiat currency. This results in the strengthening of the currency. The problem here is that all uses of fiat currencies are a delicate balance. Create too much currency and you have massive inflation. Print too little and you don’t have enough growth. This balance, which is mostly controlled by monetary supply and interest rates, is what most countries are struggling with right now. How do you continue to create growth without collapsing an economy? If we want to be successful investors, we need to look at what is happening in front of our eyes. Sure we could debate different economic theory and how things should be… or we can just deal with reality and make the best of what is actually going on. What I am going to lay out here is mostly US centric. However, the resulting opportunities are for anyone, regardless of the currency you use or country you live in. According to government data, we (the US) have very low inflation. Low inflation rewards savers. This means that anyone who has cash sitting in a bank account (or under their mattress) is not at significant risk of losing their wealth. Low inflation means that a fiat currency is not losing its purchasing power. Take Disneyland for example. Over this past weekend, the theme park increased its ticket price to $124. That’s triple the cost since the year 2000. 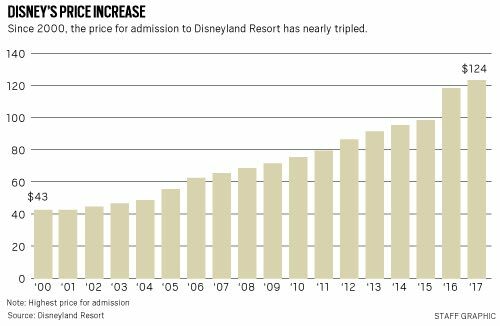 That means it’s 250% more expensive to go to Disneyland today compared to 1955. Now, even though I can’t stand going to Disneyland, you could argue that Disneyland might be 250% better than it was in 1955. But, you get the point. There are many expenses in our lives that are much higher than the ‘official inflation statistics’ would indicate. Now, to further complicate things, the relationship between different currencies can add inflationary type effects. The best way to see how this works is to look at the Big Mac Index. 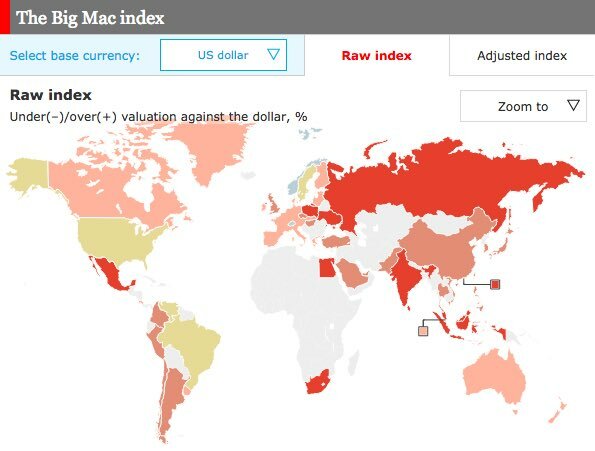 This index shows you the prices of a Big Mac around the world. A Big Mac is a standardized product. Of course there will be a few differences in the quality of a Big Mac in different countries, but in general, they are all the same. Let me highlight Big Macs in Switzerland versus Big Macs in Ukraine. I was literally just in each of these countries last week, and went into a McDonald’s in each country. I can assure you they are nearly identical. Well, Switzerland’s currency – the franc – has performed very well versus the dollar. Ukraine’s currency – the Hryvnia – has performed horribly. Now, remember, those Big Mac prices are in US dollar terms. Those who saved money in Switzerland are rewarded, because their money didn’t lose purchasing power. The opposite is true for those in Ukraine. For anyone holding US dollars, this concept is very hard to understand. The idea that something will increase (or decrease) in price dramatically over a short period of time seems impossible. But, if you’re in Ukraine and you have been saving money (or Mexico, South Africa, Colombia, Turkey, Chile, or any other country that has seen recent inflation), then you’d know how devastating inflation can be. Let’s look at a couple investing options for those holding US dollars (or euros, or a currency that has not seen recent inflation) AND a couple options for those currently holding a currency that has already seen inflation. 1. Inflation harms savers. This is because an individual’s savings are being devalued by the decrease in a fiat currency’s value. Imagine how many Big Macs someone can buy before versus after an inflationary period – a lot less because a currency loses buying power. 2. Inflation rewards debtors. This is because debt is inflated away by the devaluation of a currency. So, if a person has debt, the money they owe will become less valuable over time in an inflationary period. There are a variety of strategies you can pursue to preserve your wealth if you currently hold US dollars. The general idea is that you want to put your money (fiat currency) into assets that match inflation. The most common way to do this is to buy real estate. And, if you can leverage your purchase, you are hitting a couple of birds with one stone. Remember, inflation rewards debtors. So, if you purchase real estate through a traditional home loan, over time your debt will be inflated away. Allowing inflation to wipe away your debt. Preserving your wealth by holding as asset that generally matches inflation. US dollar holders can also buy assets that have been negatively influenced by another currency’s inflation. There are other options too, if you don’t have a large sum of money to invest. You can buy shares of a company (or commodity) that will generally match inflation and hopefully create more value through the business they operate. One of the simplest and cheapest ways to protect your wealth if you’re currently holding a strong currency is to buy physical precious metals. I’ll have a buying opportunity soon, for those interested. On recent travels to Colombia, Turkey, Ukraine, and Mexico I’ve seen this first hand – those holding local currencies feeling helpless to the effects of inflation. Here are two great money making ideas for those who are currently holding a weak currency and fearful of losing more of their wealth due to inflation. First, create a service that caters to investors that want to purchase assets in your currency. For example, I have a close friend who sells real estate in a country that has seen recent inflation. This has significantly depressed housing prices, which has attracted many foreign investors. Right now, he literally does not have enough inventory to sell. He has buyers lining up and can’t find enough real estate to supply their needs. He’s doing great. So, what’s in your country that foreigners would want to buy? Find that thing and start selling it. Second, create a business that makes transactions in US dollars (or euros or another strong currency). That’s the incredible thing about the internet. If you are sitting in a country with a weak currency, you can sell your skills (or sell whatever you want) to someone in any country in any currency. For example, let’s say you’re a translator, but you live in Ukraine. Set up a website (or use Upwork, Freelancer, or even Fiverr) and start charging in US dollars. Essentially, you’ll be using currency arbitrage to preserve and build your wealth. Later this week I’ll show you why you should be concerned about the strong US dollar and why inflation may be on the horizon. A very valuable post! So much in here. I especially like how you show how someone can benefit from inflation in a country like Ukraine. On the surface it looks only like a negative for Ukrainians, or other countries going through similar situations, but there is an oportunity in this for people in these countries. Not many people are going to look this deep. But you have! You talk about how inflation negatively effects fiat currencies. How do you feel about the nonfiat “crypto” currencies, like Bitcoin, regarding overall utility and safety and for protection from inflation ? Cryptos are great ideas. I’ve been invested in them since early 2012. However, they are still maturing, so there is a lot of ‘shake-out’ that still needs to occur. It’s a great speculation. Why do you say Crypto currencies are not fiat currencies. You are not suggesting crypto currencies are money are you ?